At my dinner table, I have invited Dorothy Sayers, my favorite golden age mystery writer, Louise Penny, my favorite modern mystery writer, and US Navy Rear Admiral Grace Hopper, my inspiration for achievement against impossible odds. The venue is Queen’s Head Eurobar & Restaurant in the Grand Central District of St. Petersburg, FL. We will start with the amazing seared scallops and crispy chickpeas – followed by seared salmon, steak and ale pie, fish and chips, and New York strip steak – crowned by sticky toffee pudding with white balsamic honey, whipped cream, and butterscotch ice cream. Local craft beer will be paired with each course. I write in the woodshed out back. Yes, you heard right, I do. We converted my husband’s former woodworking shop into a writing retreat. It has the perfect key elements of complete privacy and all the creature comforts a writer could wish – a comfortable desk that adjusts from sitting to standing, a coffee maker for energy and a view of the bird feeder for inspiration. My best writing time is early morning. Between the magic hours of seven to eleven, the words just spill onto the page. Apparently my internal editor doesn’t show up for work until the crack of noon. I have my only cup of coffee at about six thirty then break for strong tea after the first concentrated sprint. I read two to three books a week. One of them is usually non-fiction about the craft of writing. In fiction, I read across the entire fiction spectrum from YA, Science Fiction/Fantasy, Thriller, Cozy and sometimes Westerns – rarely romance – although I will read that as well. I can also read more than one at a time, so they are strewn all over the house in little ‘to be read’ stacks. I constantly read in my genre of Cozy Mystery to keep up with my friends and sharpen my writing tools to learn new trends. My most recent “great” read was for my library’s mystery book club, Ghostman, by Roger Hobbs. What is the most challenging area for you as a writer? What are you doing to address the issue? I loath the approach of the middle muddle in each manuscript. 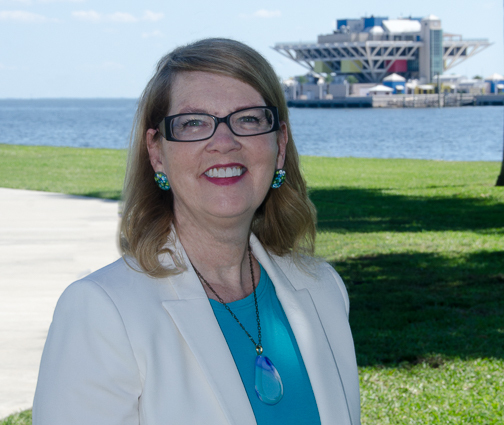 I enjoy the start and have a great time introducing the characters, the unique setting of Central Avenue in St. Petersburg, FL, and then, whoops, there’s a body. After that, the hard work begins and doubt seeps into my flying fingers. I’ve started to focus my already detailed outline more strongly in the middle with a definite event at the midpoint. That helps. After I get through it and can see the finish, I perk up and race to the most beautiful words in a writer’s world – The End. The thrill I feel after laying down my words keeps me writing. I’ve always loved to tell stories, but writing them down give me an unexpected sense of well being. When the words are flowing, I’m extraordinarily happy. 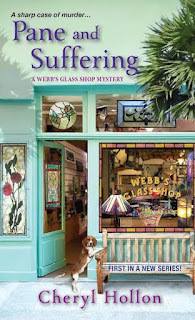 My current traditionally published series with Kensington, Webb Glass Shop Mysteries, started with the idea of combining my love of all things glass with my love of writing. My husband and I have a glass studio in a converted apartment behind the house and we’ve been producing artworks for many years. We take classes, get advice, and buy materials from a local business, Grand Central Stained Glass. Merging the two arts has been magic for me. I hope it shows in the writing how much I love the combination. The best advice for me was from the first book I read about the writing life, Write Away by Elizabeth George. She says, “Here’s what I tell my students on the first day when I teach one of my creative writing courses: You will be published if you possess three qualities – talent, passion, and discipline.” I keep this book within reach. To solve her father's murder and save the family-owned glass shop, Savannah Webb must shatter a killer's carefully constructed façade. . .
As if the coincidence of the two deaths wasn't suspicious enough, Savannah discovers a note her father left for her in his shop, warning her that she is in danger. With the local police unconvinced, it's up to Savannah to piece together the encoded clues left behind by her father. And when her father's apprentice is accused of the murders, Savannah is more desperate than ever to crack the case before the killer seizes a window of opportunity to cut her out of the picture. . .
Great interview, Cheryl and Jim! Cheryl, in addition to wanting to read your book I'm now hungry to eat at your fav restaurant -- sounds delicious! Will have to look for it if we're ever in St. Pete's. Thanks, Vickie! The Bouchercon Conference in 2018 is being held down here. We'll definitely need to go to Queen's Head for a night out. Nice interview! Cheryl, I'd also invite Louise Penny to dinner. She is one of my favorite authors.